As outdoor advertising takes the digital world by storm, the industry must work harder to show marketers what’s on offer. “We are at the point where many marketing professionals’ perceptions are at odds with the new levels of digital sophistication available across the OOH medium. In the UK, millions of pounds worth of investment in digital over the last few years has created a medium that is capable of delivering broadcast reach, measurability and brand fame at a national and regional level. It’s no coincidence that some of the world’s top brands are already taking advantage. 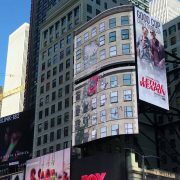 It’s now paramount that we educate the masses on the new digital opportunities available as well as reiterating the strengths of our traditional formats.”Aside from digital, the industry has invested heavily in audience planning, intelligent content and data platforms such as Clear Channel’s ground-breaking Play IQ. Yet the research findings would suggest that this news isn’t reaching marketers.